Date of publication: December 23 2014 . Dear readers, as you may have noticed in our category alterations IKEA We pay a lot of attention not only alterations on children, but does not deprive the attention of our smaller brethren. 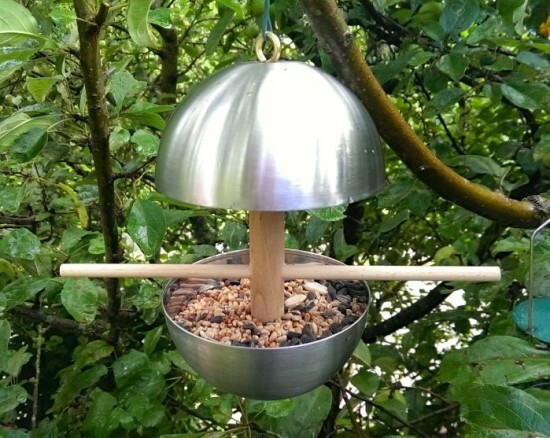 Today we will please his reworking of birds, personally make bird feeder. For us, it is even a kind of excursion into childhood, when we were making birdhouses and bird feeders, which are usually made of plywood or a packet of milk. However, from what has been made to any feeder, with its help we will not leave in the lurch feathered friends and help them through the tough winter. Moreover, today we show you how to make a bird feeder beautiful, functional, how to turn it into an element or backyard garden interior. Birds not only delivered us aesthetic pleasure, but also help to destroy various pests in the area. Let's get started. Take two Serving bowls Bland FORM diameter 12 see. Their advantage is that they are made of stainless steel and perfectly will take any weather conditions. Also, we need a wooden stick, which we consolidate these two bowls on both sides, as shown in the photo. Exemplary parameters wood blank: 2 cm in diameter and 19 cm long. The second piece of wood will serve as a pole, which can perching birds. Its approximate dimensions - 25 cm in length and 0,8 cm in diameter. We hope you and, most importantly, your feathered friends enjoy our remake.